This is where our members bask in the limelight! Arturo Lopez recalls crunching tin cans for use as balls as a child. Streetplay's member spotlight features stories by our readers about play and growing up. Please let us know if you would like to be in the spotlight. A worldly look at baseball - Arturo Lopez talks about the role stickball played for him while growing up. Aerial warfare in the Bronx - Bruce Chance recalls the kite battles he'd have growing up in the Bronx. Beating the big kids - Bill Weintraub's team wins with a shot that's still sailing. Hooping all over town - Wendy explains how she became the queen of the hula-hoop. Jewels of the junk drawer - Jeanne remembers how little she needed to create a world of fun as a child. Like father like son - Angel Quinones Sr. and Jr. share their love for the game. My day at Shea - Tommy Russo gets to throw out the first pitch and stops the Met's catcher in his tracks. My first kiss - Jeanne and her friends talked about it and waited for the big day. Was it all she imagined? Multipurpose tool - Stu and his friends sometimes had to borrow their equipment. Nicknames - A nickname recalled after many years. Object of Desire - Billy Jacobs explores a powerful temptation and quandary he faced as an 8 year old boy. Oh so foul - Jeff Benson anticipated a great game, but things didn't quite work out. Ouch, that Buick hurts! - Rich "Bearsy" Gray remembers what happened when Big Frankie stepped up to the plate. Superballs off the roof - Jeff recalls going to great lengths for that magical bounce. The gridiron workhorse - Ira Mevorah recounts his exploits as captain of one of the worst football teams in recent memory. The secret of success - Joe Carrieri recalls the promise he made when he began as a Yankee batboy. 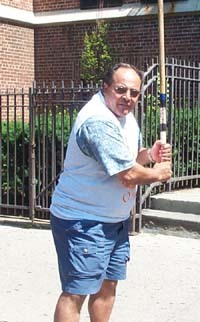 West coast style - Willie Blas brings a new look and feel to the stickball bat.